After yesterday's brush with the Slovan Death Boys the EFW fun bus rolled onwards to Sparta Praha B v Zbrojovka Brno. 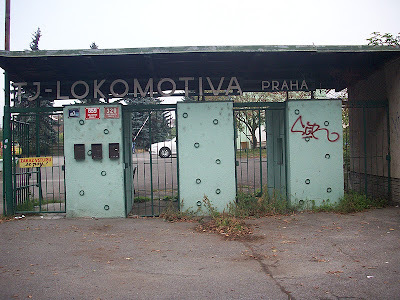 Stuff that, Spencer and I revved up the EFW motorbike and sidecar, put on our goggles and sped off to the arse end of Prague to watch the Bohemian League match between Loko Vltavín and FK OEZ Letohrad just because the Stadion na Plynárně has a hedge in along the side of the pitch. Come to see the hedge, you've only come to see the hedge! Yes, yes we have. Rusty sign with textbook eastern European club name – tick. Please keep off the hedge. Look at that picture. Look how happy I am with that textbook example of, if I'm not wrong, a European Beech hedge. But it's not just that the hedge that's given me that odd smile and the stare of a mentalist, the choice of a bit of early 2000 skate punk in the form of Sum 41, The Offspring and then 'Eye of the Tiger' playing in the background has made me deliriously happy....that, and I was probably still a bit pissed at that time in the morning. The teams came out and were greeted by the site of a bit of flag waving, a man airing his duvet on his tower block balcony overlooking the ground, an Englishman inappropriately fondling a hedge and a huge pink skull (almost Tony Harrison from the Mighty Boosh esque) rotating on the roof of a nearby tower block. 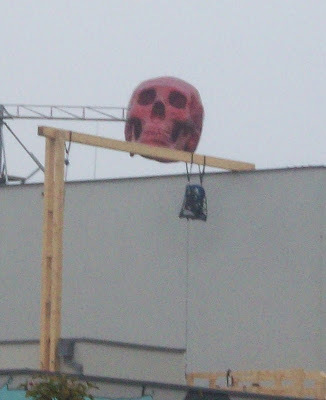 We weren't the only ones to spot it, in fact you could say the large pink rotating skull turned a few heads. (Sorry) The managers, one resplendent in classic eastern European fake leather jacket, take their place in eastern Europeans largest technical areas, the Vltavin physio pulls his Sparta Prague hat tight round his head and the away subs cosey up under a leopard print rug and it's game on! Just what the bread dumplings is this all about? And it's game on straight away Geoff. Before you could say 'Tea Martin' the tiny scoreboard confirms it's 1-1. Letohrad's equaliser after five minutes coming after the Vltavin keeper had pelted the ball into the pivo belly of the on rushing striker. After thirty two minutes Vltavin take the lead again thanks to some pretty poor defending and increase their lead further on forty two minutes when a free kick bobbles in after it's completely missed by everyone. Or, as the Letohrad website, via Google translate, reports it “the fate of the match decided desetiminutovka stillborn between 32 and 42 minutou....home first shook a criminal kick from the boundary of a large lime”. Quite. Wooly hat and shorts. That's not gonna keep you warm. Nice flag though Mr Inseminator. At half time everyone troops off to the clubhouse to escape the cold and for a pivo and/or grog and a cigarette. The fog is so thick you can only barely make out the AC Milan and Karel Poborsky (of course Karel Poborsky!) shirts on the nicotine soaked walls. If the hedge wasn't enough foliage based excitement for one day it got better. Outside the clubhouse a volleyball stadium is badly losing a battle against weeds, the sight of this unexpected treat had the, by now three EFWers, salivating a little (a LOT). 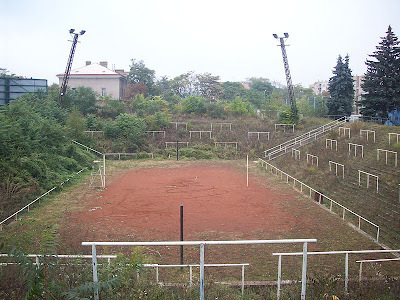 An overgrown volleyball stadium. Mmmmm. Overgrown. Rusting umpires chairs, 45 degree angle floodlights slumped forward waiting for their chance to shine again and terraces tormented by cruel Mother Nature. Did I mention there were no women on this trip? Strange. What have you done Mother Nature! Why!! The second half sees Vltavin continue to dominate with some slick passing football and they have further chances to score. Letohrad offer little in return and their one decent shot in the second half brings a great photo save from the keeper and the resulting corner leads to a shot that was so hopelessly wide it probably landed on the volleyball court. Mmmmm overgrown volleyball court. 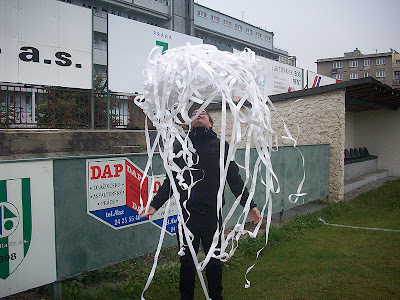 Vltavin have no trouble defending their lead and the victory is celebrated with Klinsmann dives in front of the Inseminators who shower the pitch with rolls of paper. The tiny scoreboard is removed, the duvet is retrieved from the balcony and we jump back into the motorbike and sidecar before the vegetation in this fertile part of Prague begins to subsume it. 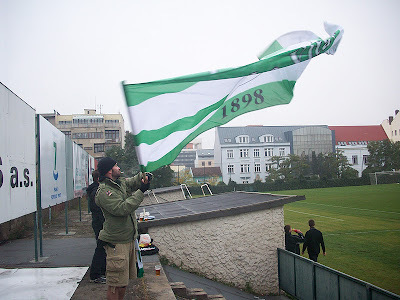 Next stop, Czech 9th division football!! Tonight Matthew, I'm going to be an Inseminator. 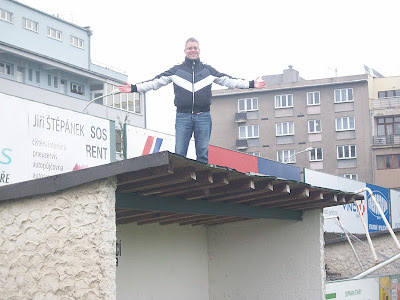 Get down from there Spencer, what have I told you about climbing on dugouts at Czech 3rd division grounds? There's two photo montages from this trip set to the music of The Arcade Fire and The Stone Roses. Kenny Legg is the Editor of the 5 star rated Adventures in Tinpot. Hedges at football grounds eh? Good old life. That hedge at Honved! Woof! If only we'd found the magic door there..I don't think I'd have controlled myself actually. I wouldn't be too daft to pitch up at Brechin just to see their version would it? Section 8, fig. 2(b) of the EFW charta says "Always try to use correct spelling of team names". So if I may, it's Loko Vltavín we're talking about. Wanted: new sub-editor for award winning football blog. GSOH preferred but not essential.